By Miss J. Burgess, Waikanae. THE NEW ZEALAND SMALLHOLDER, April 16th, 1935. 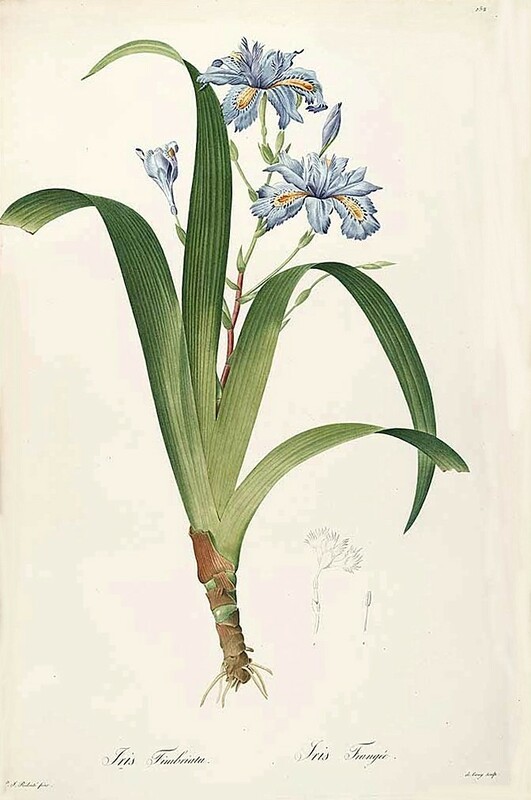 Although one or two of the crested irises are known to the New Zealand gardener, there are several species of this interesting section which are rarely if ever seen in this country. It is generally believed that the Iris genus is divided into two divisions, the bearded and the beardless irises. However, there is a group intermediate between these two divisions, a group that is distinguished by possessing a crest in place of a beard on the fall. All the members of this group are rhizomatous rooted, though the different species vary greatly in the shape and size of the flowers and the height to which the plant grows. The name Evansia was given to the section in 1812, in honour of a Mr Thomas Evans, of the India House, who had introduced Japonica into England a year or two previously. Japonica, which has two synonyms, fimbriata and chinensis, is the best known member of the crested section. It is a native of China and Japan. In England, Japonica can only be grown and flowered successfully in a greenhouse, but in many parts of New Zealand it has proved almost hardy. It will stand quite a heavy frost as far as the foliage is concerned, but I frost of six or more degrees may catch the flower spike before it emerges from the foliage, so that in most districts some slight protection is advisable towards the end of winter when the buds are forming. A lover of lime and a sunny aspect, this species is by no means difficult of culture. The flowers are a delicate and delightful shade of lavender blue, lightened by a light freckling of gold at the throat. They are borne on gracefully branched stems about two feet in height. Each stem carries a large number of buds, which give a succession of bloom over several weeks. There is an entirely hardy form called Ledger's variety which has slightly larger flowers of nearly the same shade of lavender blue. Both Japonica and this hardy form flower in the early spring. From the Himalayas comes Millesii, named after Mr Frank Miles, who introduced it into cultivation about 1880. It is a distinctly handsome Iris, and the tallest of this section. Perfectly hardy and easily grown, it requires like Japonica, lime and a sunny position. The flowers, which appear at the end of October, are borne on 3ft. well branched stems, which continue to develop flower after flower over a period of eight or ten weeks, a surprising long period for a single species. The flowers themselves are about 3 inches across, and are a delicate lilac, spotted on the fall with a deeper shade of the same colour. The foliage which is extremely ornamental, is a clear light green which shows up as a distinct contrast among most other plants. Better known, perhaps, is tectorum, from China and Japan. The Chinese grow this Iris on the roofs of their houses, whence the name tectorum and the popular name of "roof garden Iris". It was introduced in 1874 by Mr William Bull. The flowers which are flattened, as in Iris Kaempferi, are from 3 to 5 inches across, and are borne on 12 inch stems, each of which carries from two to three flowers. The colour is a deep lavender blue, with a conspicuous white crest on the fall. There is also a really charming white form of tectorum whose purity is enhanced by a soft yellow signal patch. This white form sets seed readily and comes to colour. Both the blue and white tectorum are perfectly hardy, and the culture is the same as for japonica and milesii. A dainty little Iris of less easy culture is gracilipes, from Northern Japan, where it grows on wooded slopes with a cool aspect, and in loose vegetable soil, in much the same conditions in which primroses thrive. This and speculatrix, about which later little is yet known, are the only grassy leaved species of the section. They are delicately fringed flowers of gracilipes, which are borne on 6 inch stems, are a pale lilac pink, lightly touched with orange on the fall. There are two American representatives of the Evansia section, cristata and its Canadian form, lacustris. These are dainty little miniatures, cristata being 4 inches, and lacustris two inches in height. The flowers are lilac, and in cristata about one and a half inches across, in lacustris one inch. Culture for both is the same as for gracilipes. Cristata, comes from the Southern States of North America. Credit and copyright Iris Hunter. Iris Evansia, Crested Iris, CHENGDU.